Everyone loves them. You can fry them, mash them, make soups out of them, and roast them. They’re the ultimate side dish, and make for a perfect snack. They are, in my opinion, the most versatile vegetable. 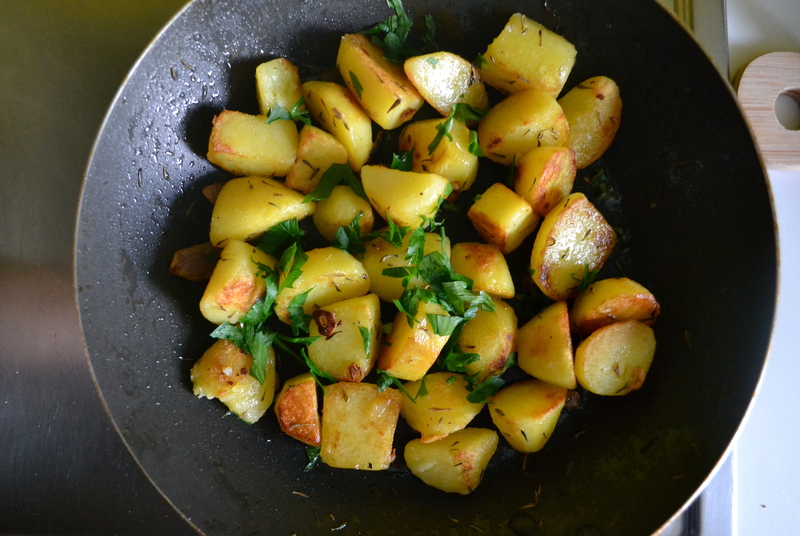 I truly love fries, but when you need to add some character to your main course, there’s no going wrong with these golden potatoes. They’re so simple to make and don’t require fussing over the stove. Just flip them once halfway through the cooking time and they’ll crunch up perfectly. For presentation purposes, use baby potatoes with their skins on. If you only have large and oddly shaped potatoes at home just peel them and cut them into 1 inch pieces. For quick cooking, parboil the potatoes before hand. This is actually pretty handy, because if you’re having a dinner or lunch, you can parboil the potatoes before and just cook them in the butter and oil right before serving. Put a pan on medium heat (it should be big enough for the potatoes to be placed in one layer) and once the pan is hot add 1 Tblspn butter and 1 Tblspn oil. Add the potatoes and garlic, sliced if you want a strong flavor and whole if you want subtle flavor. Let them crisp up on a medium heat, about 5 minutes on each side. Before flipping the potatoes sprinkle over some salt and dried thyme. Once you’ve turned over each potato add in the remaining butter and oil. That’s all! Just remember to keep the heat on medium so the potatoes don’t burn!